In January, Istanbul’s Yedikule urban gardens endured yet another act of harassment. 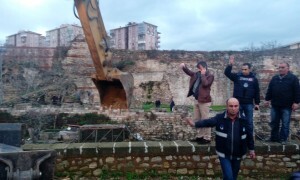 The Istanbul Metropolitan Municipality sent an excavator along with two busses full of armed policemen and demolished nearly 60 sheds where the gardeners kept their seeds, supplies and chickens. The Municipality claims that the gardens are illegal and that the gardeners are occupying land that does not belong to them, announcing that production in all the gardens would end by March 2016. This isn’t the first offensive action taken against the beloved gardens. 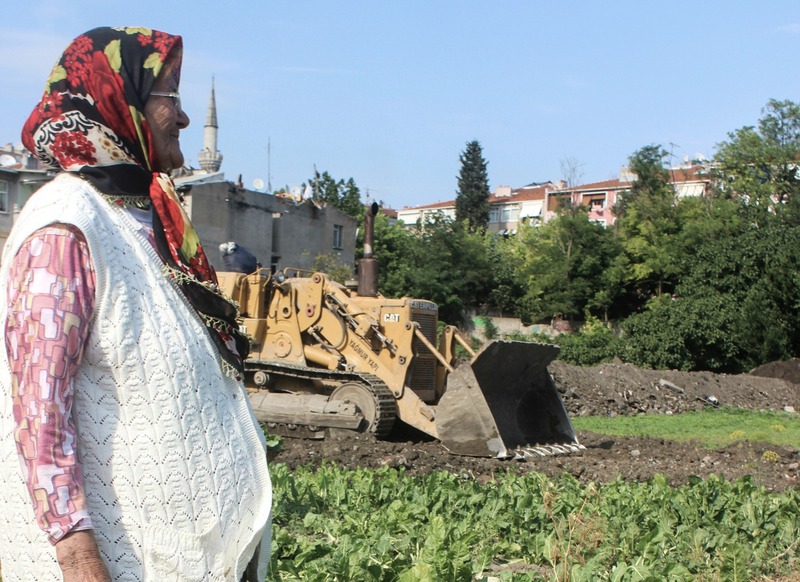 On July 8, 2013 the conservative, pro-government Fatih Municipality authorized the use of excavators to dig up vegetable beds, covering them with refuse and cement. Historians, architects and archaeologists were the first to object in solidarity with the gardeners. Reacting to the protests, the mayor of the Fatih Municipality announced that the land had no historical or cultural value. He claimed that the land was not an area of agrarian production and would be converted into a recreational park. Destruction of garden property and claims against their legality is an insult to the history and the intelligence of Istanbul’s residents. These are 1,500-year-old gardens that hold a tradition of land usage spanning from Byzantine times through the Ottoman period to modernity. They existed long before the Ottomans took Constantinople and long before the Republic of Turkey was established. The fifth century Theodosian walls and the gardens within represent the layers of history that have made Istanbul a World Heritage City. The walls were recognized as a UNESCO World Heritage Site in 1985, but the gardens, just as venerable and worthy of cultural heritage status, weren’t. The Yedikule gardens have long been recognized as a place of cultivation, having been mentioned in sixth century Byzantine text as a place to grow a variety of vegetables, keep farm implements and store produce. As one of the largest and most fertile green spaces to survive in Istanbul, they are a tangible connection to the city’s urban history, withstanding change and continuing to grow vegetables, including their well-known Yedikule Marul lettuce variety, which has been added to the Ark of Taste. Slow Food in Istanbul has done everything in its power to communicate with the authorities, asking parliamentary representatives to find a solution. In collaboration with the Yedikule Bostancılar Derneği and the Yedikule Bostanları Girişimi, Slow Food Fikir Sahibi Damaklar will continue to work to recover from the destruction and convince the Istanbul Metropolitan Municipality to preserve the urban gardens. They urge the Slow Food network all over the world to help raise an international voice in solidarity. The destruction of the gardens needs to be stopped.